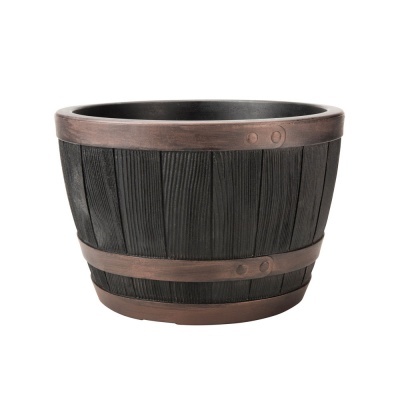 Stewart Garden Blenheim Half Barrel 40cm Planter with 'Copper' painted rim offers a multi-use gardening feature that does not look out of place. Suited for many uses including provision as a planter for deep rooted shrubs, patio vegetable garden or even as a patio pond water feature. Made in the UK from high grade plastic, but designed to look authentically wooden, with painted copper effect bands. Gardeners get the benefits of a beautiful, lightweight & durable planter that is UV stabilised, shock and frost proof.